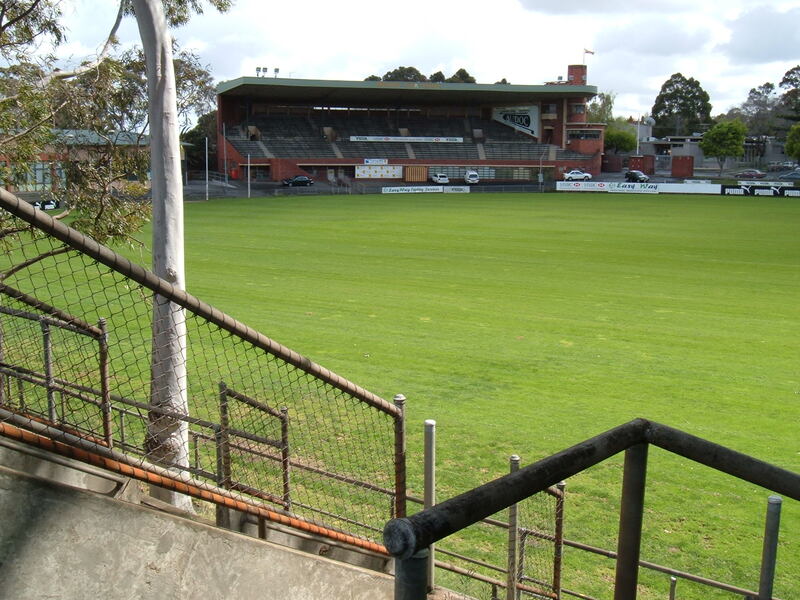 Glenferrie Oval: League venue: 1925-1973. League (VFL/AFL) matches: 443. Record Attendance: 36,000-Haw v Carl, 1965. Glenferrie Oval. I must have passed it by train a thousand times. I’ve heard many a father trying to convince their unbelieving youngsters that Hawthorn actually used to play games down there on that skinny patch of grass, my own father included. It is hard to imagine that 36,000 once managed to cram into that space. 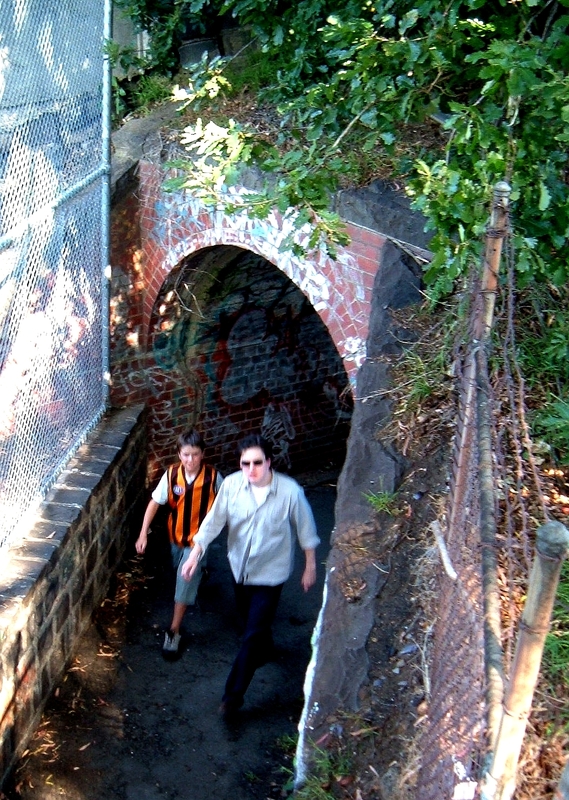 Surely the most unique of Melbourne’s league football grounds, Glenferrie Oval was opened in 1906, the Hawthorn Football club finally settling there after numerous homes previously. Flanked by train tracks and Linda Crescent, the oval took on an unusually narrow shape, and spectator facilities on the wings were rather creative. Hawthorn, until recently, had one of the smaller followings of the Melbourne clubs. Having joined the league along with Footscray and North Melbourne in 1925, with the VFL nearly three decades old, these three clubs found it hard to attract large supporter bases. While North and Footscray still struggle with this, Hawthorn’s astonishing success from 1961 (10 flags and at the least one flag in each decade since) has finally seen it become a genuinely big club. It was the first of the three 1925 “newcomers” to outgrow it’s original home, leaving in 1973. 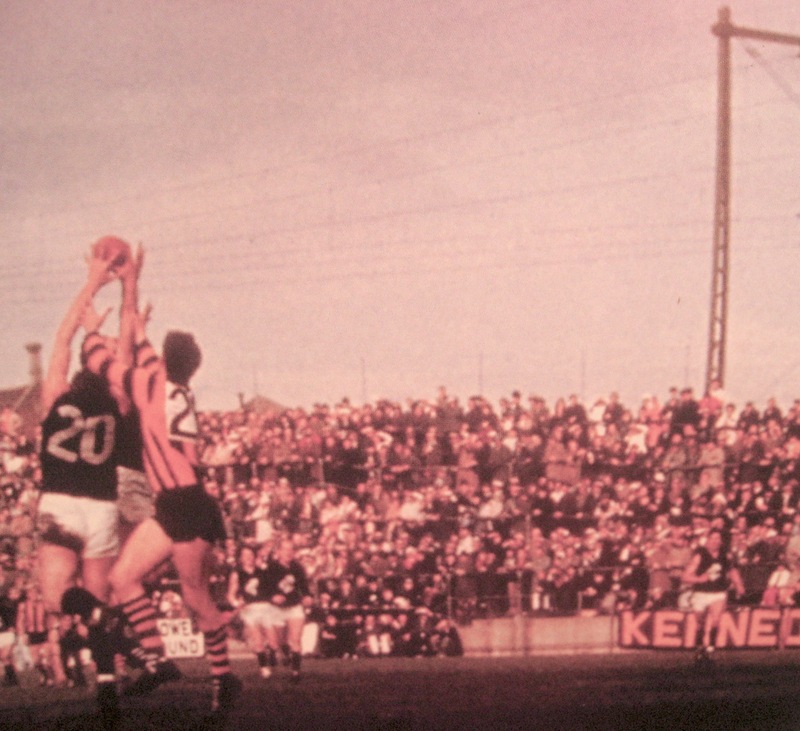 However until that point, Glenferrie Oval had been apt in its size. 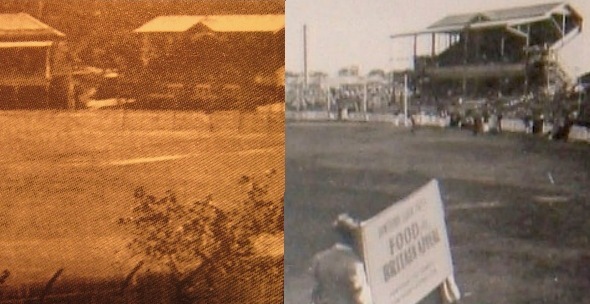 The grounds first main grandstand, as opposed to pavilion, was an old wooden stand transported to the ground from the old East Melbourne Cricket ground upon it’s demise in1921, standing until the 1960’s, when it made way for the Dr A.S. Ferguson stand…which has since been cut in half! 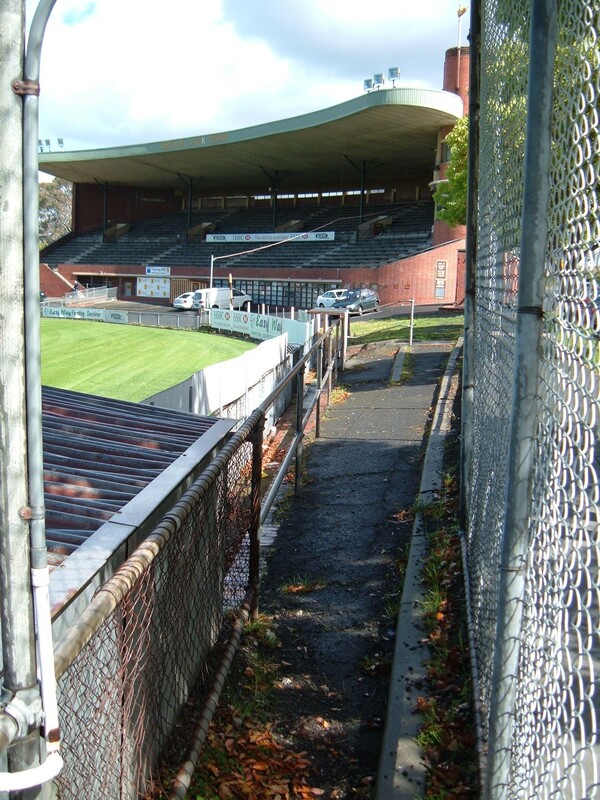 Above is the old wooden stand, East Melb C.G on the left, later at Glenferrie on the right. Below is the Dr Ferguson stand, which has been neatly halved since its glory days. The classic art deco styled Michael Tuck stand, built in 1938, was clearly given it’s name in retrospect, as Michael was still some decades from making his debut. 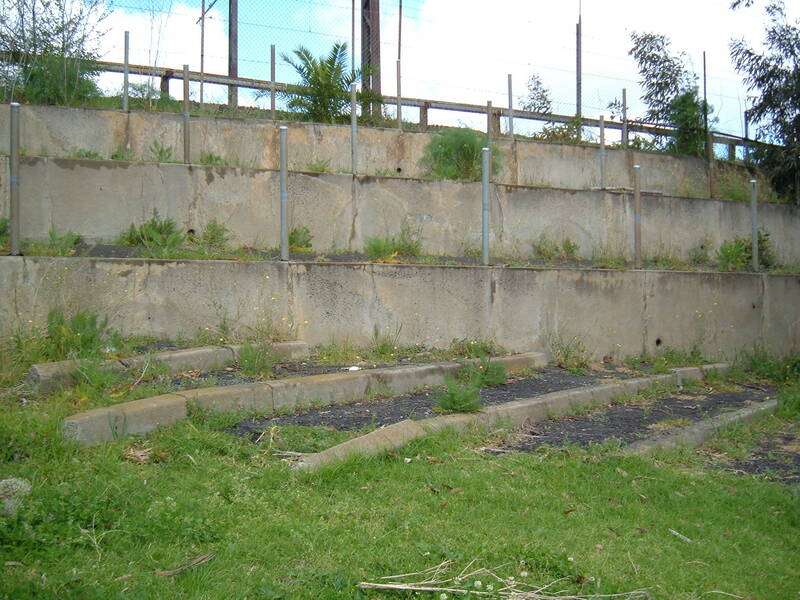 The ‘red-brick stand’ as it was known, to me defines Glenferrie Oval. It is superb. Just walking up the stairwell and into the upper tier actually gives me goosebumps. My wife does not understand this phenomenon. It oozes cinematic charm and elegance, a far cry from the simplistic yet still charming stands which adorned the more working class suburban grounds. The stand has gained recognition world-wide for its unique design and is acknowledged as an art deco design of significance. 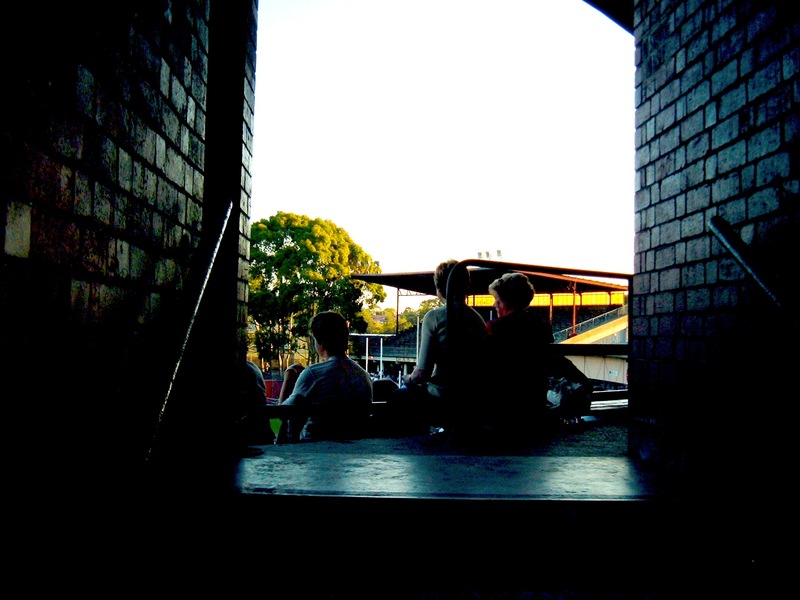 On one of my trips to Glenferrie Oval to take pictures several years ago, I was snooping around as per usual. I’m always looking for that odd little feature which I’d never seen before. Amid my treasure hunt, I was startled by an older guy who popped his head through one of the grandstand nooks to ask what I was doing. My natural thought was that I was an imposition, about to be told in no uncertain terms to buzz off. With Hawthorn still using the ground as a training facility, my Richmond polo shirt would surely not aid my cause. However my anxieties were soon at ease, as this gentleman was clearly no threat. In fact I recognised him instantly as Graham Arthur, captain of Hawthorns first flag in 1961. And what did he want? He wondered if I’d like a tour through the ground. Wonderful. I hadn’t let on as yet that I knew who he was, and he’s not the type to parade himself around. Introducing himself simply as Graham however confirmed my near-certain suspicion. As we wound the narrow corridors of the old red-brick stand, it was as if in a time warp. There were signs of current day things, players boots lying here or there, but the walls were filled with old stories. Graham led me around, showing me this and that, still not feeling the need to let on who he was. I’m sure he assumed I wouldn’t have know him anyway, yet I have a keen feel for the games history and study it religiously. Up musty stair cases, winding this way and that, we came to a room out the back where the trainers put on a barbecue and beer night after training every Thursday. Players, Graham told me, were often in attendance. The very notion in the present day seems preposterous, yet it was a different place and time. It was in this room that Graham took me to a picture on the wall of a young strapping man, clad in brown and gold, sending the air-conveyence closer to goal. I was sensing a reveal. Very humble, almost embarrassingly so. I played along with him, feigning surprise, though I still reacted so that he knew that I’d heard of Graham Arthur, to give his ego a little boost. 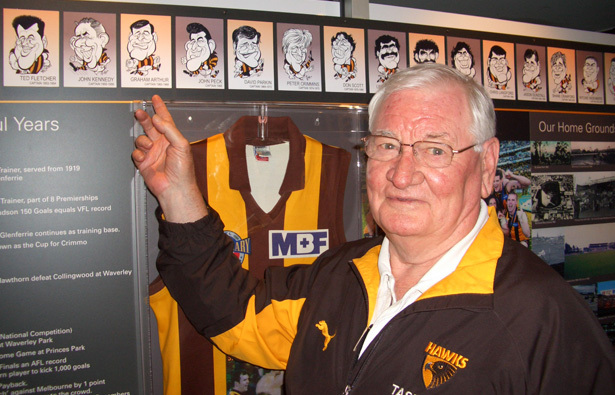 Graham and I continued over to the Dr. Ferguson stand, plain on the outside, yet housing a past players bar and a comprehensive Hawthorn museum, since transported to Waverley park. We finished the ‘tour’, which I must add I paid nothing for, over the road at the old Hawthorn social club, since sold off and demolished. I thanked Graham immensely, and continued on my way. Graham Arthur was so easy to talk to and very humble, and the fact that in retirement he returned to his club to contribute says something about him. But back to the oval. The Sardine tin, as it was affectionately known, was one of the earlier suburban grounds to bite the dust. With no room to expand the playing surface or spectator facilities, the ground always had a limited lifespan. 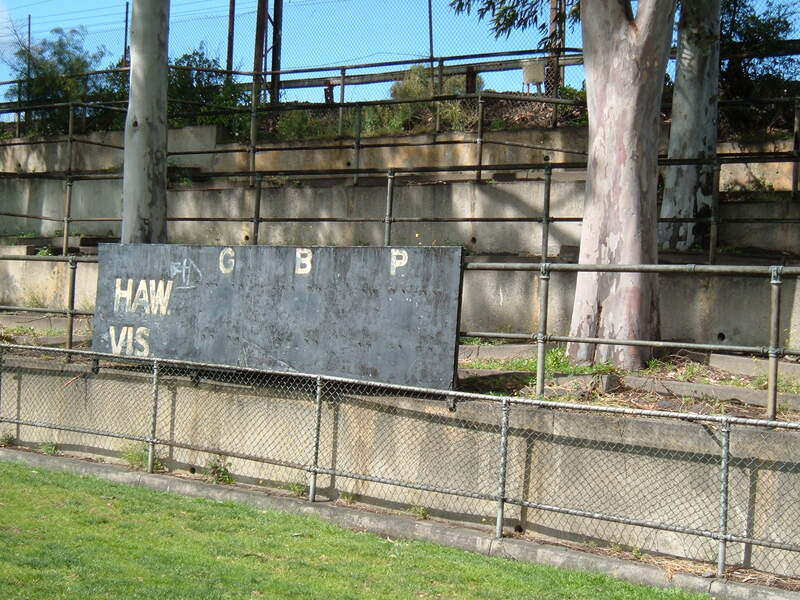 The Hawks have left, and upon my recent travels past the old ground, it’s looking a bit sad. The turf was the first thing to fall by the wayside, and whilst I am far from impressed with the amount of advertising at AFL grounds, jumpers, shorts, even the Sherrin, this tired little ground seemed somewhat lifeless now that even the advertising hoardings no longer lived there. I guess it served as a stark reminder that Glenferrie Oval no longer plays a part in league football. Another fantastic video showcasing Glenferrie circa 1969…a whole quarter! Courtesy of Damian Watson on the Footy Almanac website. 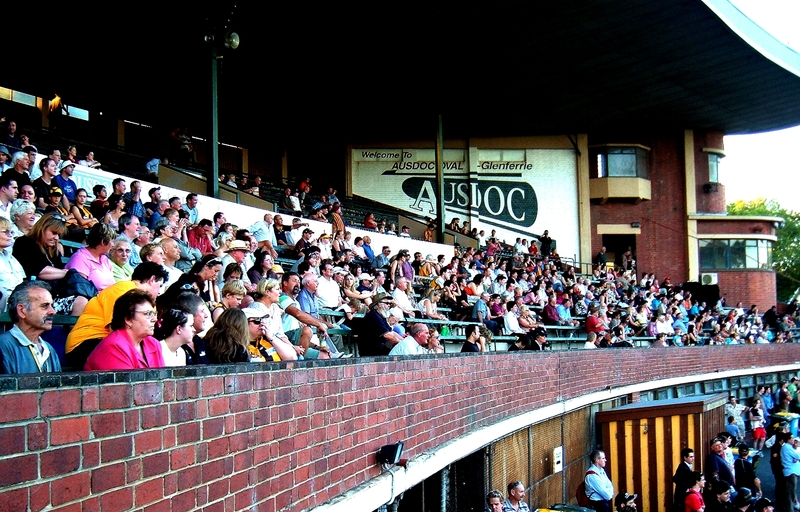 This entry was posted in Home & Away and tagged art deco, football, Glenferrie Oval, Graham Arthur, grandstand, Hawthorn, suburban, Waverley park by theholyboot. Bookmark the permalink. Another fine piece of reminiscing, made all the richer by the spontaniety of the occasion, and Graham Arthur’s generosity. Good stuff.